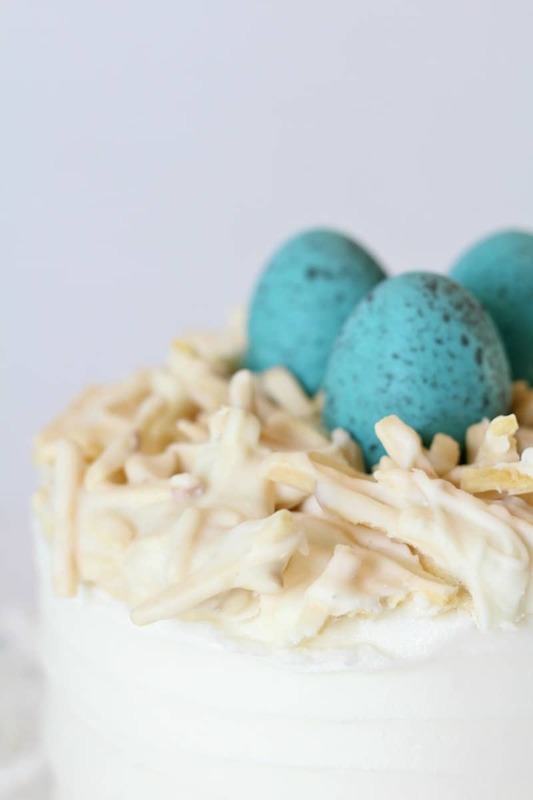 What’s your favorite Easter treat? Is it Robin Eggs? The Reese’s Peanut Butter Egg? Peeps? Ok, all of those are great, but my absolute favorite is the Cadbury Egg. Do you share the same love? I don’t know what’s inside those things (I probably don’t want to know), but it is AMAZING. 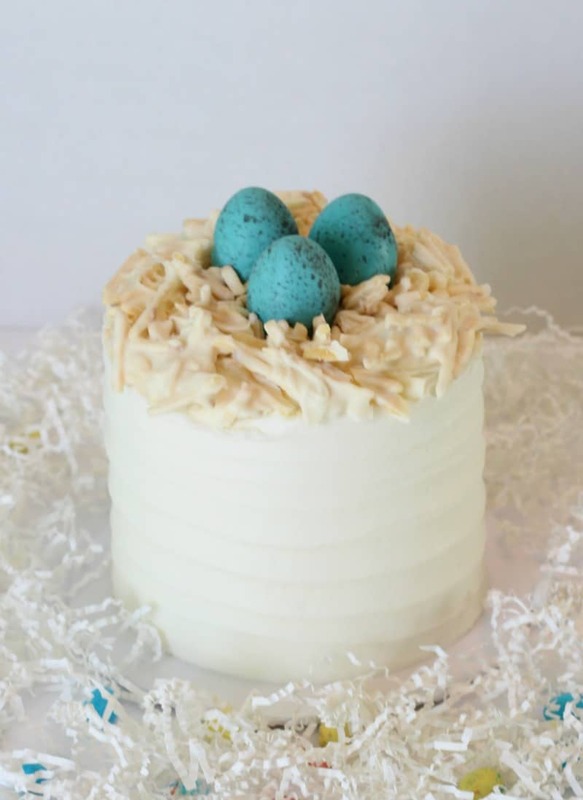 I figured I’d combine my two loves (cake and Cadbury eggs) into one amazing treat. 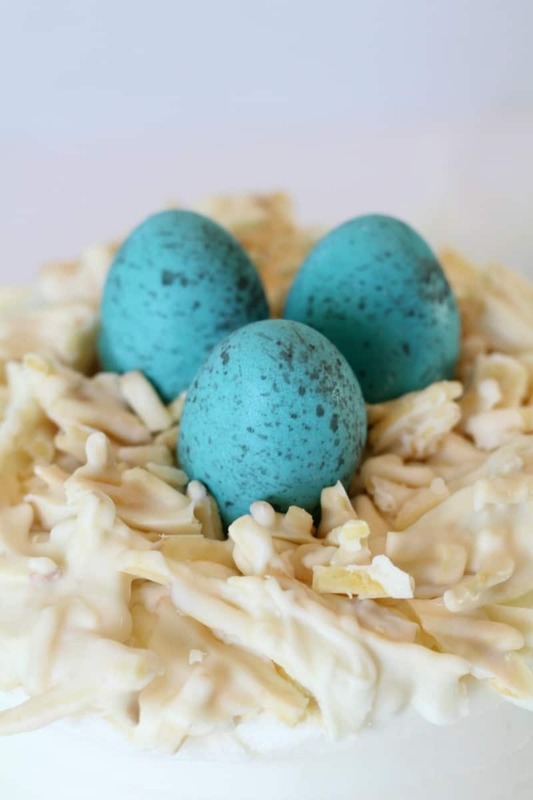 Meet the Cadbury Egg Easter Cake. 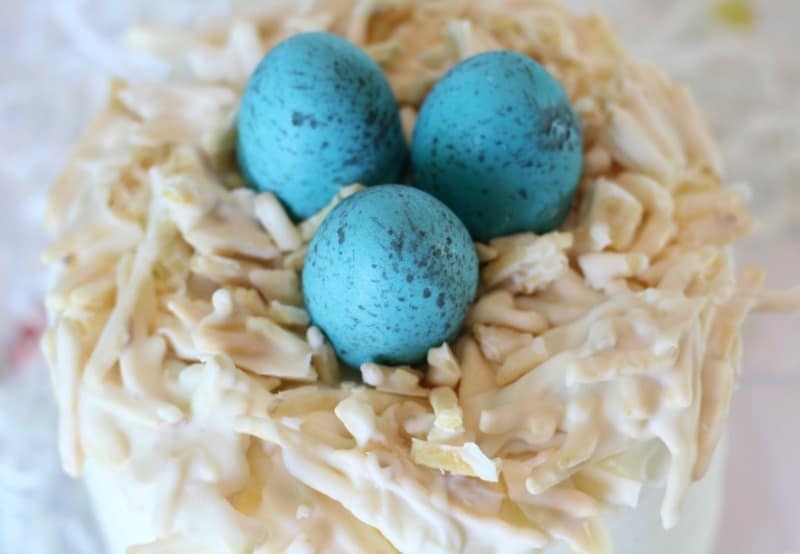 Yes those blue robin eggs on top are actually Cadbury eggs. I just added a little somethin’ special to ’em to give them that look. The cool thing is that you can still get that amazing Cadbury egg taste, but it’s in a super pretty edible package, right? So let’s get to the tutorial on how to make it. 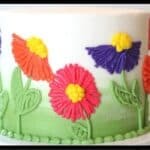 A baked layer cake (I used a 6″ cake that was three layers high) Try my recipe for Vanilla Bean Cake. It’s my favorite. Bake your cake, stack, fill and ice it. 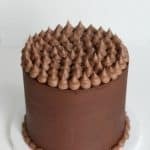 I used a flat spatula to make the ridges in the buttercream. 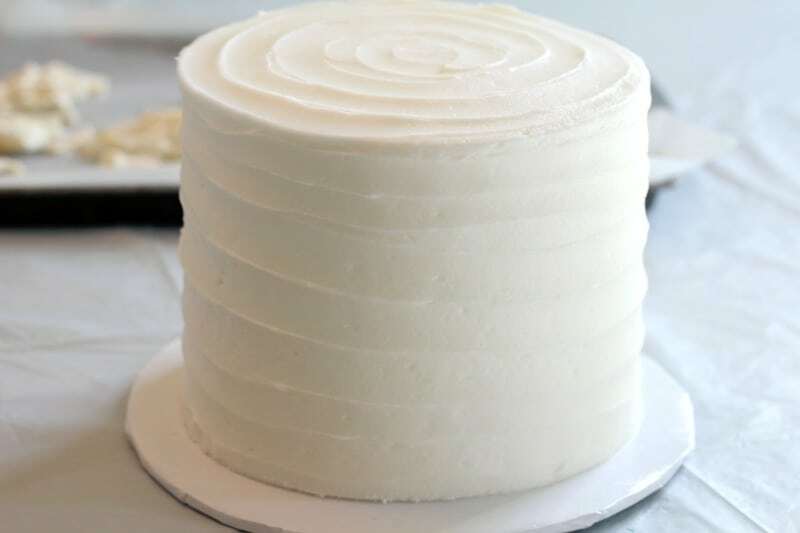 Just ice your cake, smooth it just a bit and then hold your spatula almost flat against the side of the cake. Use a cake turntable and spin it as you hold the spatula against the cake. Next you’ll prepare your Cadbury Eggs. 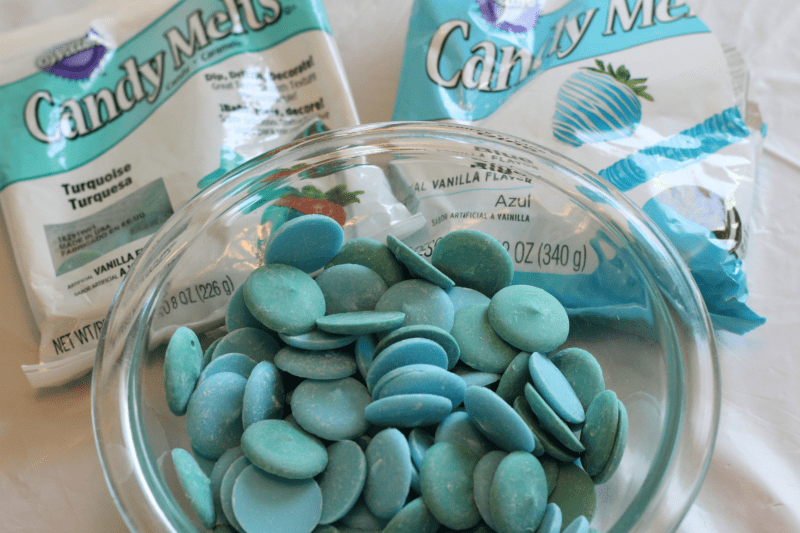 Mix together half turquoise and half blue candy melts. 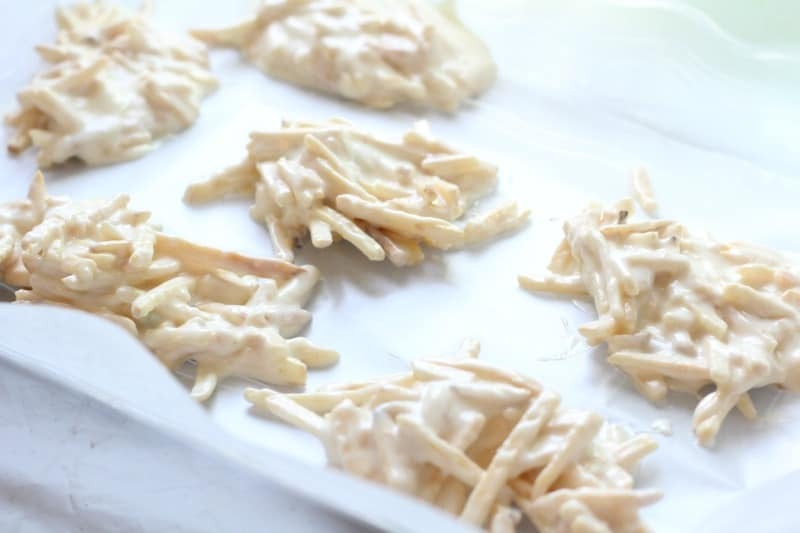 Melt them and set them aside to cool down just a bit. It still needs to be warm so it’ll coat the eggs, but not too hot that it melts the chocolate coating on the eggs. Next, take your Cadbury Eggs and insert a toothpick into the bottom. You’ll need to twist it as you insert it, so it doesn’t crack the chocolate too much. Now you’ll want to chill your eggs. 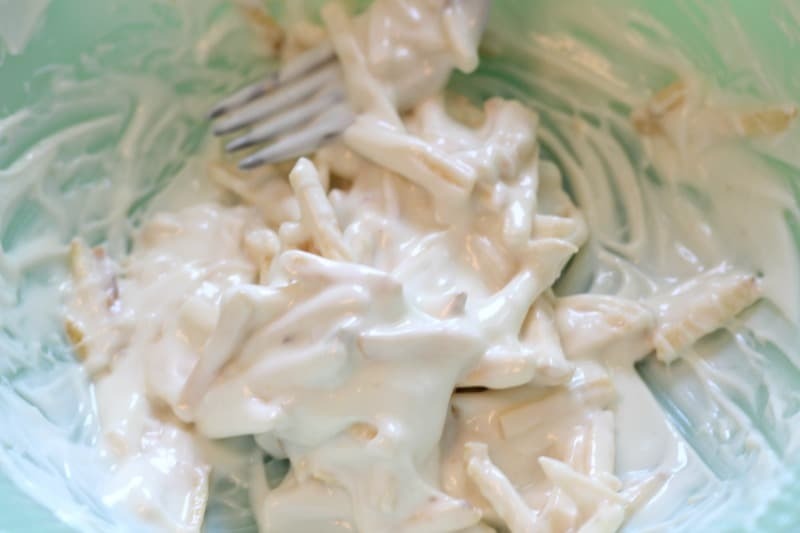 Five minutes in the freezer is plenty of time. 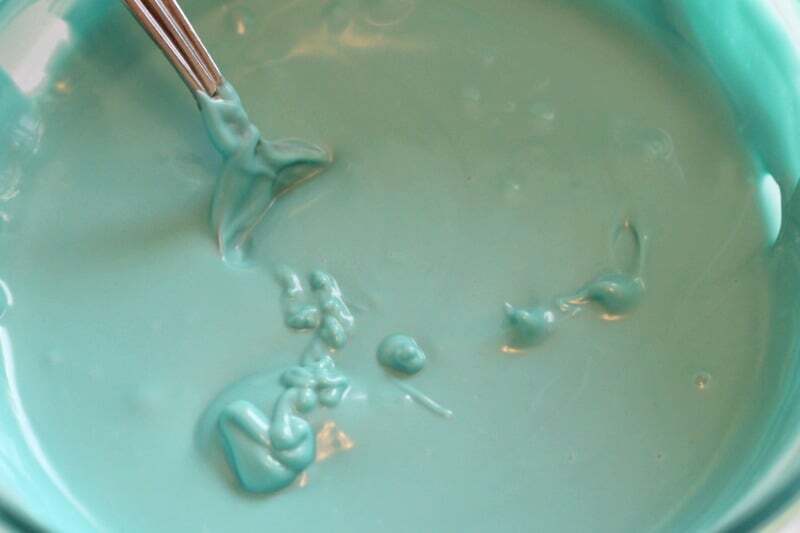 Don’t chill too long or when you dip your eggs in the candy melts, the coating will crack. Now, just let your eggs firm up. Next take your cocoa petal dust and mix with a bit of vodka or lemon extract. 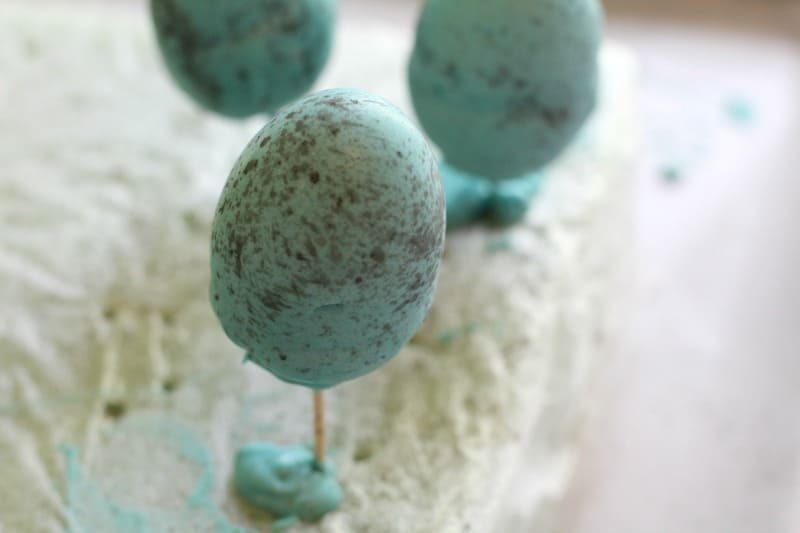 Now just take your brush, tap off the excess and then use your thumb or finger to sprinkle dots all over the eggs. 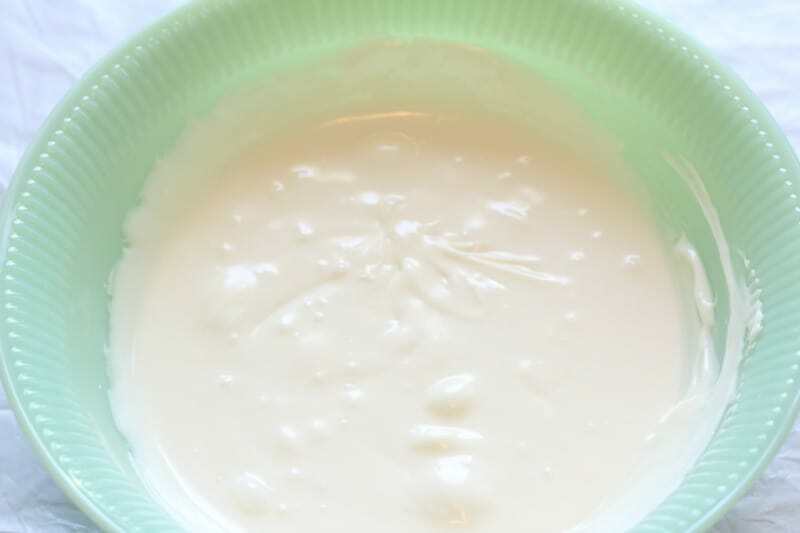 Take your white chocolate chips and melt them. I just melted them in the microwave. Make sure you only heat in 30 second intervals and stir in between. You don’t want to over heat your chocolate. Next, just grab your shoestring potatoes. I’ve seen some people who add in little bits at a time, but I found that it worked better for me if I just dumped a bunch into the chocolate and mixed it around. 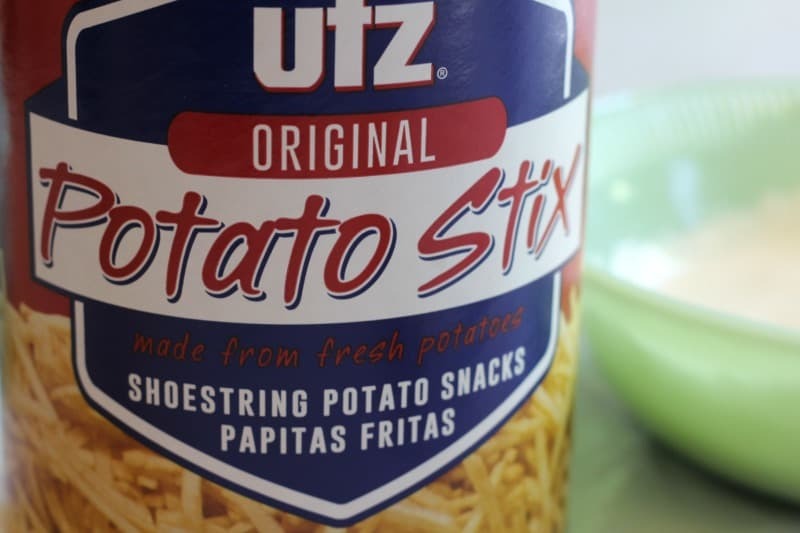 When you mix it up, just be careful to sort of fold the potato sticks into the chocolate. You don’t want to crush them. You may need to add more potato sticks if it seems like there’s still too much chocolate. 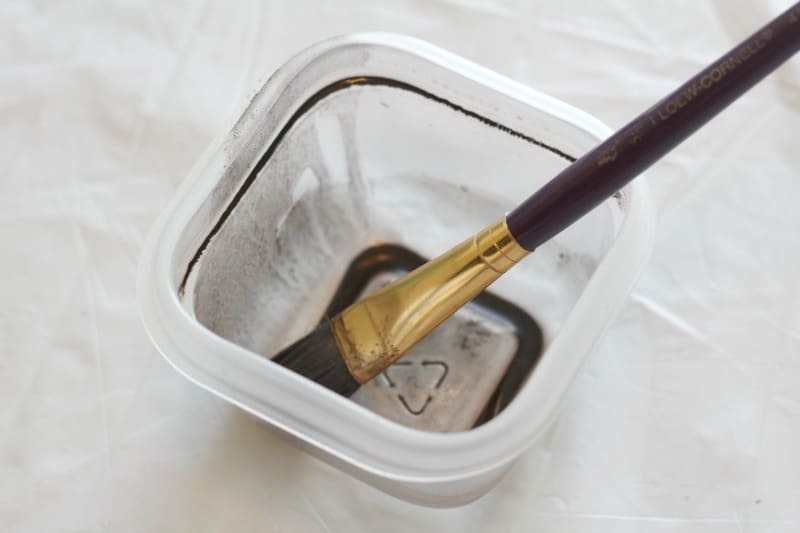 Dump them onto a baking pan covered with wax paper. You want them in little clumps. Now just let them set up. You can put them into the fridge to speed this part up. 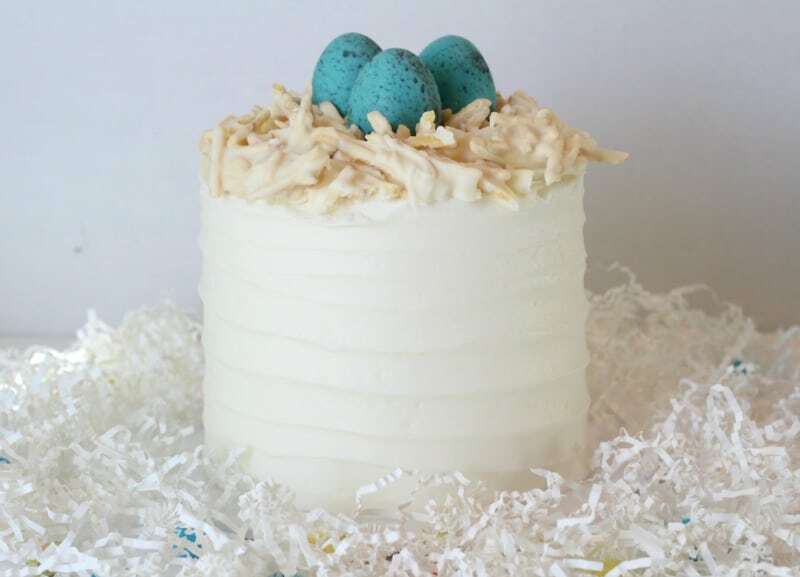 You’ll want to add a little buttercream around the top edge of your cake…like a ridge. It’ll lift it up a bit and it’ll give the potato nest something to stick to. 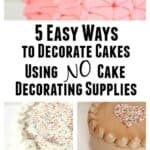 You’ll need to break some of them up a bit to get the sizes you need, then just stack them around the edge of the cake. 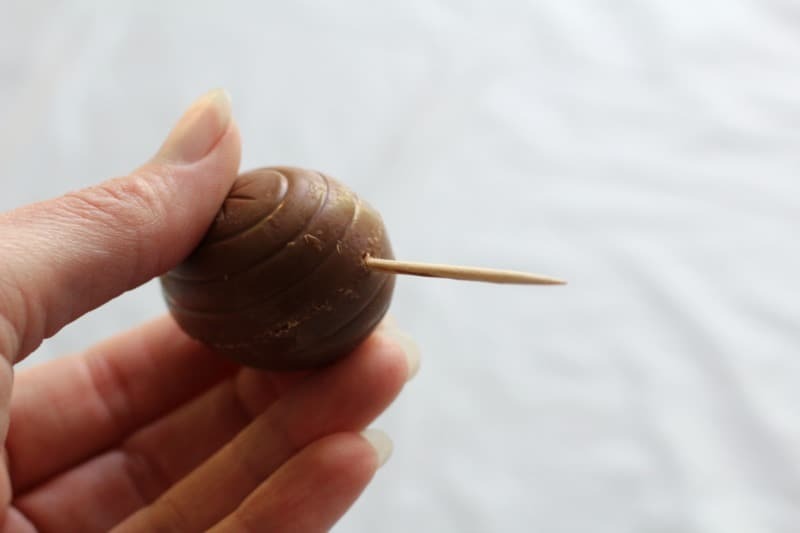 Next, take the toothpicks out of your Cadbury eggs. Just twist them as you remove them, so you don’t crack the eggs. 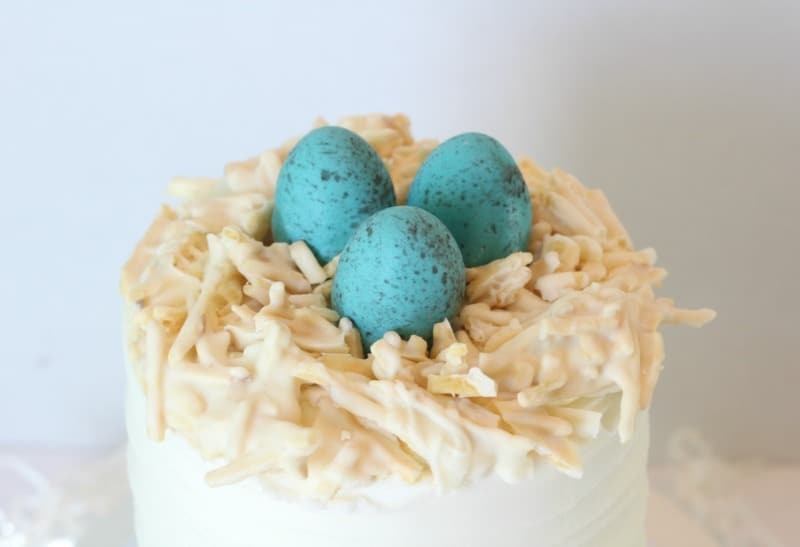 Add a little buttercream in the middle of your cake and then set the eggs on top. Break up little bits of the ‘nest’ and fill in the empty spots. Want to see the video with all the steps? Here it is! If you make this, let me know how it turned out! I’d love to hear about it. Plus don’t forget to subscribe to the blog. 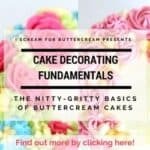 It’s free and you’ll get free cake decorating tutorials and recipes in your inbox every month!